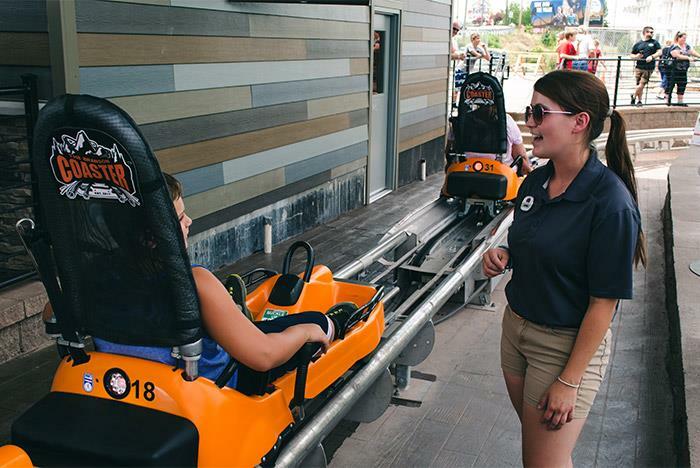 Using the natural Ozarks landscape as a backdrop, the Branson Coaster zips you through natural elevation changes for an exhilarating experience with drops and turns. Not one for speed? Control the speed of your ride with the patented braking system. Whether you want the thrill of a lifetime or a leisurely ride through the Ozarks, the Branson Coaster is the perfect addition to your vacation. Riders may not exceed in dry conditions 375 lbs or 330 lbs in wet conditions. Passengers must be at least 3 years old and between 36″ - 53" tall. Solo Drivers must be at least 54″ tall and up. To ride double, drivers must be at least 16 years old. Follow all safety information provided at the attraction. Zoom, race, and slide downhill in a way you have never experienced. 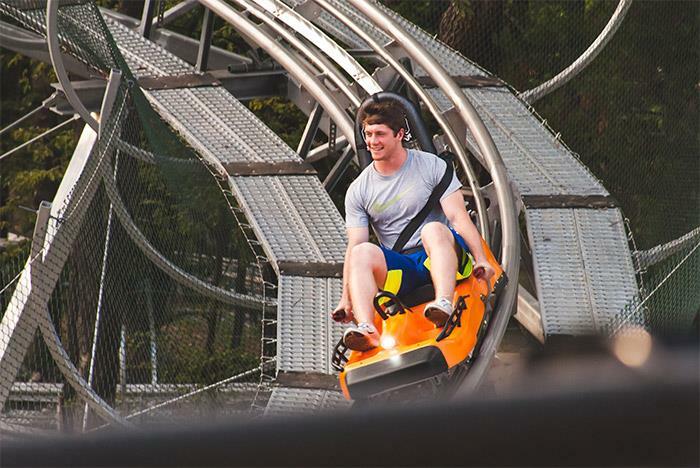 The Branson Coaster is a first of its kind double track downhill coaster. Descend the track at a speed so fast, you’d think you were flying off the track. Once you reach the bottom, a short ride to the top will bring you down on the other side of the track! • A driver must be at least 54" tall. • A rider must be at least 3 years old and 38" - 58" tall to ride with a driver that is at least 16 years old. • Weight cannot exceed 375 pounds per cart in dry conditions and 330 pounds per cart in wet conditions. • Drivers must be able to operate both brake levers and agree to follow all safety rules. What are the age and height requirements for the Branson Coaster? A lone driver must be at least 54″ tall. A passenger must be at least 3 years old and 36″ - 53" tall to ride. The maximum combined weight of the riders is 375 pounds in dry conditions and 330 pounds in wet conditions. No exceptions! Driver must be able to operate both brake levers. Riders & drivers alike cannot be under the influence of drugs or alcohol. Stay at least 80 feet from the cart in front of you, 180 feet when wet. Seat belts must remain latched until directed by the ride attendant. In addition, guests with recent surgeries or injuries should not ride. Pregnant women are not recommended to ride as well. 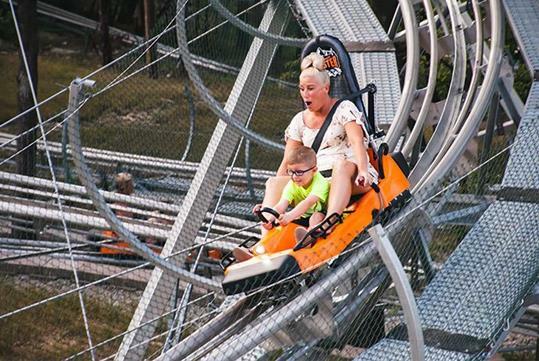 Is the Branson Coaster fast? With the installed, patented braking system, riders can control the speed of their experience. Be sure to follow the safety instructions while using the system.